Where In The World Is Rusty The Dog? Welcome to my spiffy new blog. We're still transferring over some of my oldest posts, which can be found at the old site. In the meantime, I plan to update much more often. Considering my last entry was almost a year ago, that shouldn't be too hard! It's been quite a year, full of ups and downs. That may be putting it mildly. 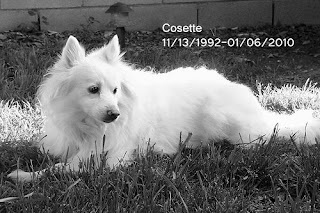 In January, my dear doggy sister Cosette died. She was 17 and lived a good, full life. It's been hard and we all miss her terribly. We have added to the family since then, but I'll save that for another time. I'm still around! Apologies for not updating more regularly. I'm 9 years old now and still working as a Therapy Dog. In fact, I went to an event yesterday and got to meet two very famous mice!